According to the actual ratings on GR, The Stranger receives exactly what it says: 2 stars for 'it was ok'. The writing style is unique in a completely different way. It is not eloquent nor anything special but the offhand way in which the story is told gives me chills. Monsieur Mersault is a freaking turf who lacks emotional intelligence. People constantly refer to him as a normal intelligent man but I beg to differ. I don't believe such people exist in only literary fiction but his cavalier personality just takes it way too far. He claims to care and his thoughts hint to some sort of normal feelings but his demeanor and acts completely contradict himself. It's not even a mask he has on but more like blatant...indifference. in other aspects, the book exceeds expectations; the title befits the book perfectly since after 100 approximate pages immersed in the stranger's head, he is still in all regards, a stranger. 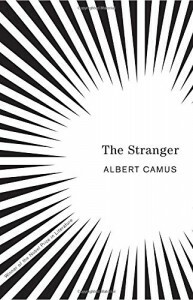 Albert Camus's has some extraordinary talent to write existentialist works like this one...I merely surmised him to be one of those famous genre authors. I'll google Camus later to check if my suspicions were correct...never mind, they are. Well, I think I'd be happier to try another Camus book and not so hastily put him in the 'disturbingly annoying box'.